I’ve come across Grumpy Mule at various foodie shows over the years, and I have to confess I’ve been underwhelmed – then again, drinking hastily-brewed coffee out of a small paper cup while standing in the middle of a large, crowded exhibition hall filled with a thousand different aromas probably isn’t the ideal tasting experience! 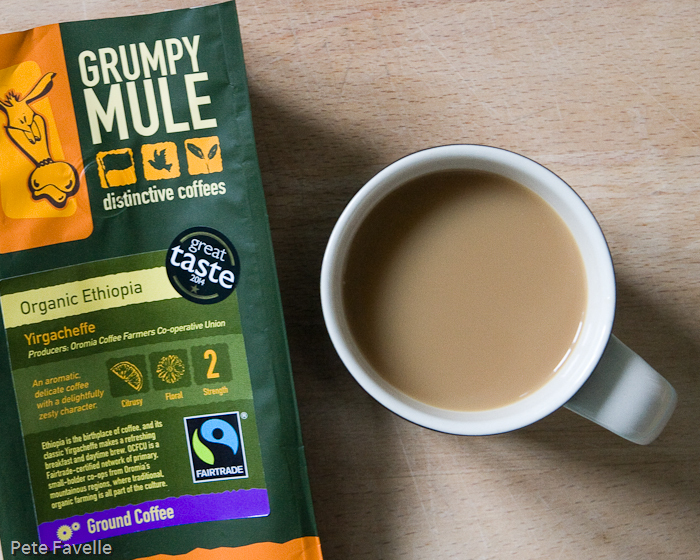 The brand is owned by Bewley’s Coffee; I’ve tried their coffees before and have been pretty pleased with them, so perhaps tasting Grumpy Mule in the comfort of my own home will improve my impression of them. Much of their range is certified organic, Fairtrade and/or Rainforest Alliance although that doesn’t apply to every coffee they produce. Grumpy Mule Organic Ethiopia is, as you might expect, from the Yirgacheffe region although the strength guide of 2 seems a little low for Ethiopian coffee. As well as being organic, it is also Fairtrade certified. The grounds have a light, slightly sweet citrus aroma along with a distinctly tea-like, dried leaf tone that comes through once it’s been aired for a while. Brewed, there is still a fruity character but it’s more redcurrant than citrus and still a slightly tannic tea character. In the mouth, that tea character persists – the body is light, almost to the point of being watery – and very little of the fruitiness makes it from the aroma into the flavour. In it’s place is a delicate citrus acidity, which leads slowly into a gentle tannic finish. It’s delicate and refreshing, and probably makes a good afternoon coffee but it lacks the punch I prefer – 2.5 stars, but if you like your coffee with a light touch you could probably add a star. Many thanks to the Fairtrade Foundation for providing this sample.